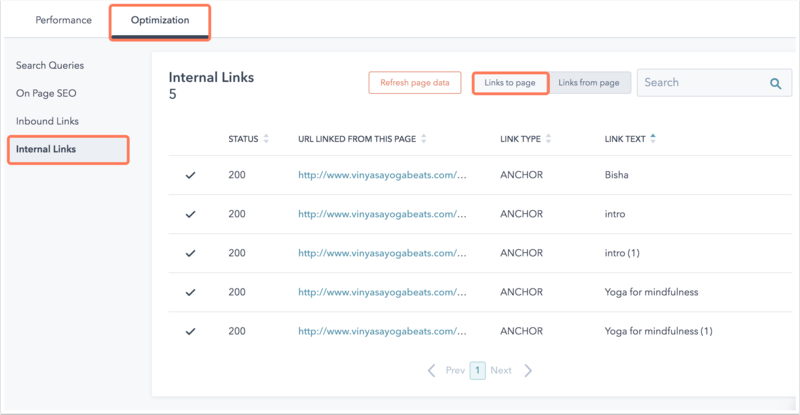 You can identify broken links on your landing pages or website pages in your page performance details in the Optimization tab. Click the name of published page to open its page details. In the left sidebar menu, click Internal Links. The table will display a list of links to and from the page. To see any broken links on your page, click Links from page. Review the Status column. A red circle with an X will appear in this column if a link is broken. You'll also be able to see the URL, the Link Type, and the text that appears on your page for this link.